Wyoming Department of Transportation figured out a way to solve a three-decade landslide issue on time and on budget by coming up with a new way to stabilize a landslide area using vertically installed micropiles. 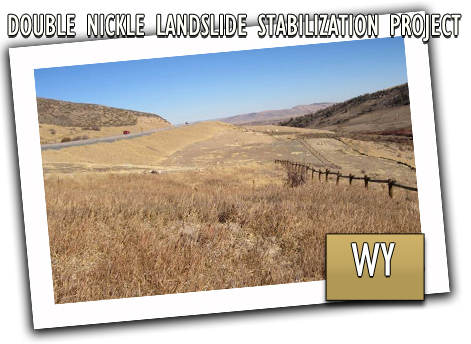 The Double Nickel Landslide (named after its location—milepost 55 on WYO 28) just south of Lander had caused WYDOT trouble since the 1980s, when WYO 28 was realigned. WYDOT tried several methods to fix the problem, but found that they only slowed movement of the landslide. But unusual amounts of water from heavy snow and rain in the spring of 2010 resulted in major slide movement and roadway damage. WYDOT needed to fix the problem for good. WYDOT needed to come up with a completely new way to stabilize the landslide, as traditional methods weren’t an option because there could be no additional right-of-way or major environmental regulatory work. WYDOT’s design consultant, HNTB, developed a stabilization technique using vertically installed micropiles (or small steel casings with a reinforcing steel bar filled with cement grout) that included four rows of 80 to 100-foot long shear piles installed through the soil and rock slide mass and embedded into the stable bedrock. The project was bid on schedule and construction began in May 2012. The project was finished in September, on time and within the $5.8 million budget. Better yet, WYDOT has a new tool in its toolbox to remedy numerous ongoing landslides impacting highways throughout Wyoming.